Coupon Specifics: Print and present this Pirate Fest coupon to the ticket booth at time of purchase to receive $2.00 off a one day Adult Admission ticket. One per person. Cannot be used on Child, Senior or Military ticket. May not be combined with other offers. No cash value. 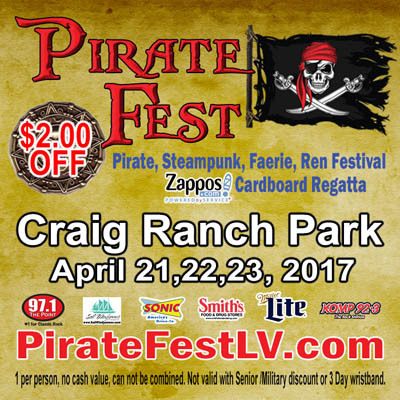 Set sail for Pirate Fest at Craig Ranch Park! Ahoy Matey! Pirate Fest is family friendly event where the focus is to participate. It features Pirates, Steampunk, Fairies and Renaissance characters that follow their own “legend”. There are unique vendors, food, beer (and RUM! 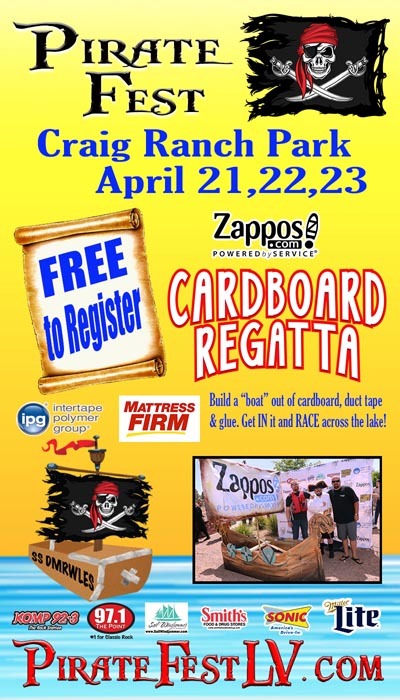 ), entertainment, activities, games created just for Pirate Fest and the Zappos Cardboard Regatta on Sunday! The Regatta has people creating “boats” out of cardboard, duct tape and glue…getting in them and racing across the lake! There are trophies for creativity, speed, and the Davy Jones Award for the best sinking! See the boats on display, vote for the People’s Choice. Then come watch them race on Sunday… some horizontally… some vertically! Kids get a Treasure Map. They travel the park completing tasks. Hoist a sail, walk a plank, fight like a pirate. Complete it and receive swag and a Letter of Marque! The games were created specifically for Pirate Fest, some you won’t find anywhere else! The goal is to participate and experience this event! We even have a contest to win a week cruise for TWO on a real tall ship in the Caribbean aboard Sail Windjammer!! Talk about being a REAL pirate! Go to the Facebook page and you could qualify for the big drawing! Pirate Fest… “Don’t just watch the pirates… BE a Pirate!”. Beautiful Craig Ranch Regional Park approximately 2 miles west of Interstate 15 on Craig.